One weekend trip to Boracay made my husband Steve and I both fall in love with the fine powdery white beach, diverse marine life, and hospitable people on the small tropical island called Boracay. We both immediately knew that Boracay were the place to start our new life, offering a change from the hectic city life in Shanghai, China. 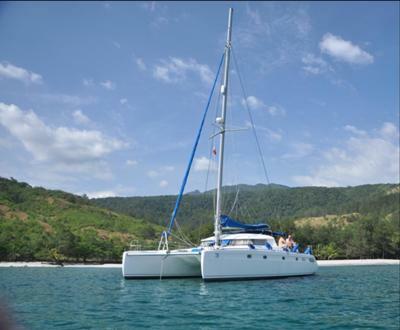 As certified sailors of ASA101, 103, and 104 (American Sailing Association) with full confidence in boats, we have sailed from Subic to Boracay earlier this January, and settled in Boracay while offering Boracay vacationers a luxury of unlimited voyaging on wide open ocean with our 42ft Fountaine Pajot catamaran named Mahal. Both of us are sincere to contribute our effort on Boracay Sailing, providing guests a true Sailing Experience and expanding their onshore experience to surrounding seas with an unforgettable sailing experience in crystal blue waters of Boracay.